Here’s how to turn an ordinary canning jar into an attractive electric lamp using a canning jar lamp kit. My sample is meant as a sewing room lamp, and is filled with colored spools of thread – but I’ve compiled a list of other suggestions so you can create a canning jar lamp that is personal to you. These canning jar lamps also make excellent homemade gifts – just choose a theme to suit the gift recipient and it’s sure to be a winner. canning jar lamp kit – these are available in craft stores, some hardware stores, and online from Amazon. There are usually two styles to choose from – one with the switch built into the socket, the other with the switch built into the wire. With both lamp kit styles, the wire exits from the socket, so there is no need to drill a hole in a jar. Fill the jar with assorted sizes of colored thread spools, a mixture of thread spools and bobbins, or lots of colored buttons. Thimbles, large colored plastic yarn needles or metal needle threaders make nice additions to arrange close to the glass. Fill jar with dried or silk flower heads, or potpourri. As you can see in this Wedding Jar Candle project, you can spray paint old potpourri for an entirely different look that retains the texture of potpourri while coordinating with your chosen color scheme. Pack with assorted sizes of pine cones, dried teasels or dried seed heads. Fill entirely with seashells or sea glass; or make a beach in a bottle – fill the jar half full with sand, then add a few fancy seashells, a small piece of driftwood and a miniature boat. Fill with marbles, polished stones, pebbles or fossils. Pack with small dolls or miniature teddy bears; colored pompoms or brightly colored beads. Pack with miniature toy cars and trucks, tiny dolls or doll house items; fill spaces with pompoms and marbles. This one can be as common as pennies or as rare as a jar of old coins. You might also consider displaying your collection of foreign coins in a lamp jar. Layered soup mixes are very pretty and look attractive displayed in the kitchen. 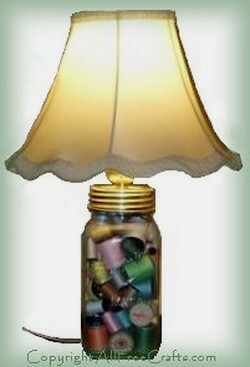 Why not use one as the base for a jar lamp? For a very easy version, simply fill with tri-color pasta, rice or dried beans. Pick up some pretty wrapped candies from the bulk food section of your grocery store; rotate every week for a different look guaranteed to enchant the grandkids. They can eat the candy from last week’s jar – and look forward to the current display on their next visit! Miniature soaps, bath cubes, bath beads or layered bathsalts all look great in a mason jar. Stuff the canning jar with a cloud of tulle or nylon netting, white or colored feathers, or handfuls of baubles such as costume jewellery necklaces, bracelets, earrings and old-fashioned brooches. How about a jar full of colored push pins, pencils, or erasers? Fill with Christmas potpourri; tiny, decorated gift boxes or small Christmas tree ornaments. Decorate large, fluffy white pompoms as snowman heads, with felt carrot noses and beaded eyes. Pack one lightly on top of another until you get to the top of the jar; the effect is rather like a crowd of snowmen trying to look out. If the filling of your jar is too light to support the lamp shade, consider adding weight to the jar in some way to add stability. For instance, you could close the end of a toilet paper tube with tape, fill it with sand or pebbles, tape the other end, then insert the tube into the center of the jar. Arrange feathers, or other lightweight fillings, all around until the weighted tube is completely hidden within the jar. Reader Idea: Use the lamp as a safe place to store cash or valuables. Simply hide your treasures in the center of the jar, hidden by whatever filling you have chosen. This is similar in concept to our book safe craft project. Tie a length of raffia around the neck of the jar for a classic country accent. Make a bow from wire edged ribbon; tie around the jar neck, or cover the threads of the metal socket/jar lid. Glue one or two items on the outside of the jar – this would work well for seashells, seaglass, fossils or potpourri, but could even be done effectively using a toy micro car, a tiny doll, or some other small decoration that suits your theme.